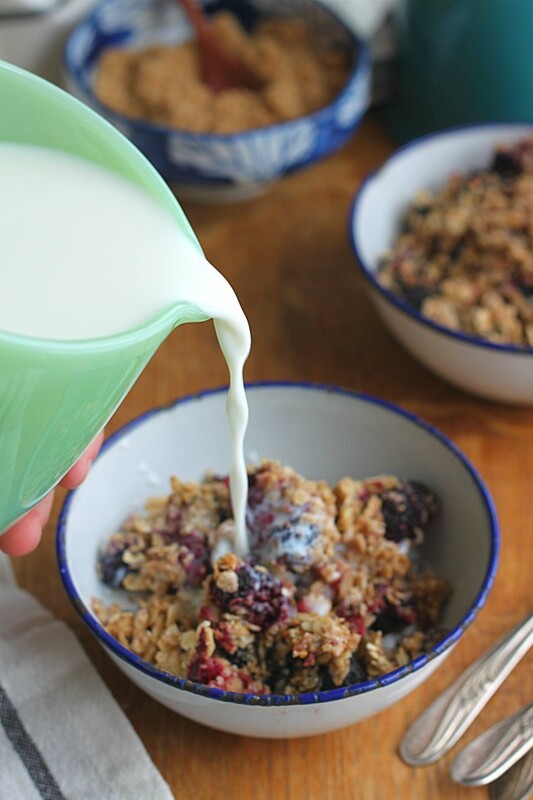 A cross between baked oatmeal and granola, this Berry Oatmeal Crunch is perfect for a healthful breakfast or topped with ice cream for a delicious dessert. Well it’s a new year! And along with a new year comes the start of new habits for many of us. Change in eating habits is a biggie…and this recipe caters to that. I recently started eating oatmeal in the mornings and mixing in berries with it. 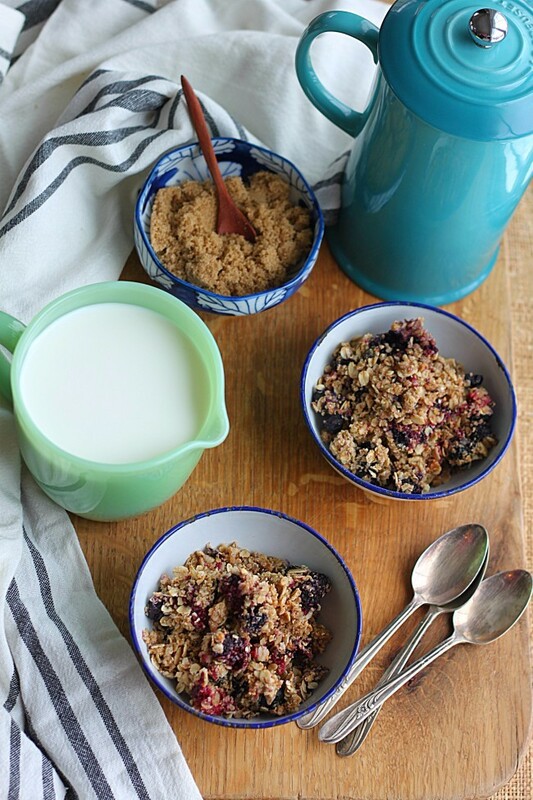 But there’s something about oatmeal…it can get boring quickly. 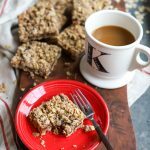 I added chopped-up almonds to mine, which provided a nice crunch, but I soon grew tired of eating the same (dare I say—gloppy?) stuff every morning. I wanted some more texture in my oatmeal. Enter this dish. 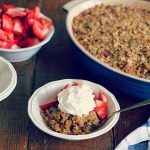 As already stated, this recipe is a good cross between that Lancaster County staple, baked oatmeal, and granola. 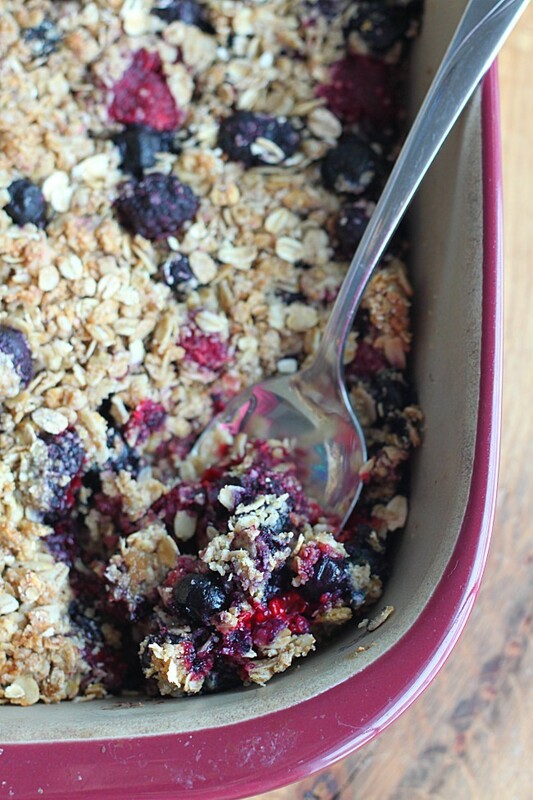 You get the crunch of granola but with the berries added, it resembles baked oatmeal. It’s a win/win. I store mine in the refrigerator and pull it out for my boys for breakfast. We’re trying to get away from boxed cereals in our house. Simply because of all the added ingredients (mainly, SUGAR) in them. 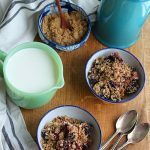 By adding this oatmeal to our breakfast rotation, I know exactly what my boys are eating and they’ll get a hearty and healthful breakfast that’s sure to satisfy. 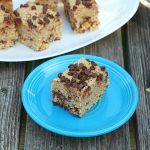 You can pretty much add what you like to this dish–fruit, seeds, nuts, even chocolate chips if you’re craving some chocolate. It’s an adaptable recipe, so make it your own! It’s perfect with ice cream too! Feel free to use on top of yogurt as well, or sprinkled on top of toast–there are just so many ways to enjoy this delightful dish. And because it’s homemade, you know exactly what’s in it. 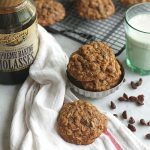 Good wholesome ingredients like Golden Barrel Coconut Oil and sweet brown sugar…this oatmeal is sure to deliver. Try it today! 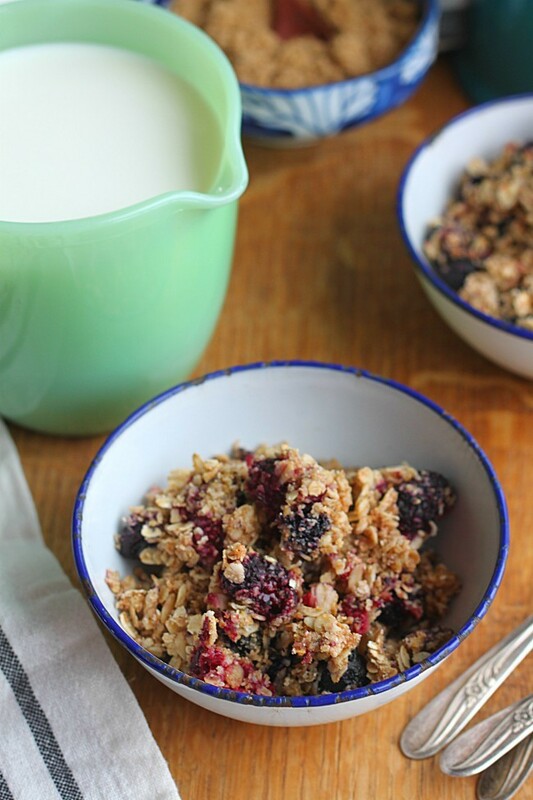 A mix between baked oatmeal and granola, this Berry Oatmeal Crunch is sure to leave you satisfied! Preheat oven to 350 degrees F. Grease a 9x13" pan with coconut oil or non-stick cooking spray. Set aside. In a medium bowl, mix together oatmeal, flour, cinnamon, salt, and baking powder. 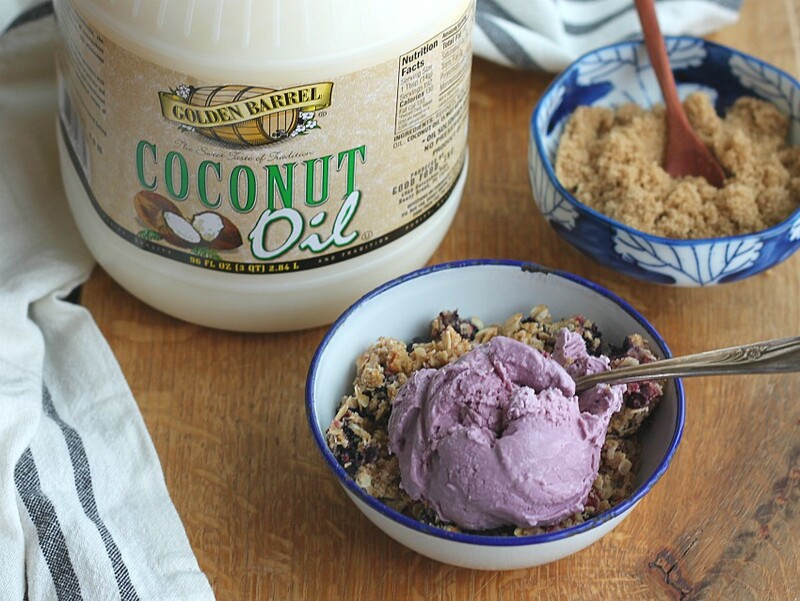 In a large bowl, mix together egg, coconut oil, brown sugar, and vanilla extract until combined. Add dry ingredients to wet ingredients and stir until formed into dough. It will look crumbly. Set aside. 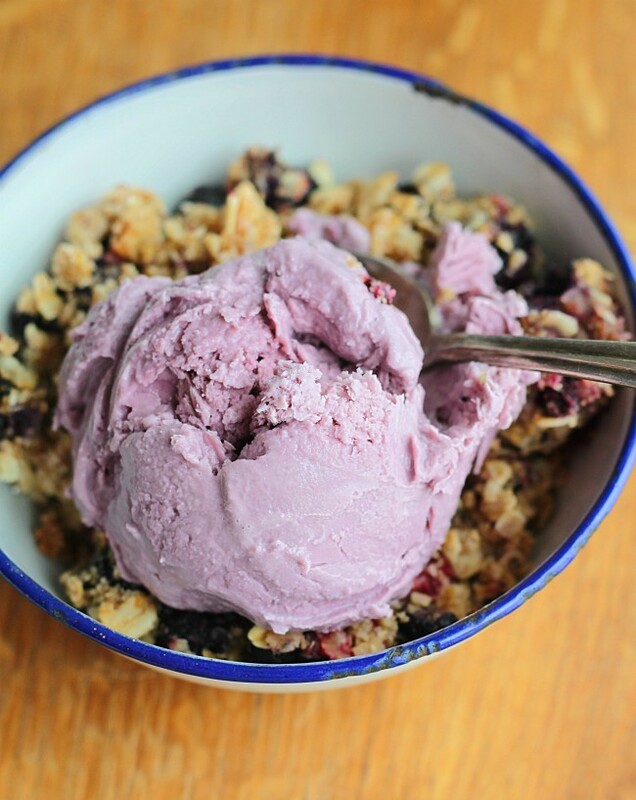 In a medium bowl, mix together berries, corn starch, lemon juice, and honey until evenly coated. Stir berry mixture into the oatmeal mixture. Pour into greased pan and spread evenly. Again, it will look crumbly; just spread as evenly as possibly. Bake for 25-35 minutes until edges are golden brown. Can eat warm with milk/ice cream or store in an air-tight container in refrigerator. *Oat flour can be made by putting rolled oats in a blender and grinding it into a powder. Measure out 1 1/4 cups of oat flour after grinding.